Right then, on Monday I promised I would write a review of the Islay walks on walkhighlands. Better do it then. Regular readers will be aware that I've been to every Islay Walking Week since its launch in 2003 and also have done a lot of other walking on Islay. I hope that qualifies me enough. The site currently lists 24 walks (if I counted correctly), 17 of them at the easiest grade. They cover a variety of walks from simple beach walks in Machir Bay, Kilchoman, well signposted tracks like the Loch Gruinart RSPB reserve trail to fairly challenging walks like Beinn Bheigier and Glas Bheinn. For each walk you get a description with pictures and various options to download or view maps and GPS waypoints. From the ones I looked at they seem to be laid out well, although as is pointed out at the bottom of each page it is still the responsibility of the walker to be properly prepared: ‘Walking can be dangerous and is done entirely at your own risk. Information is provided free of charge; it is each walkers' responsibility to check it and navigate using a map and compass.’ Something I can agree with (and like to add Islay and the Outdoor Access Code). The walks don't cover any news walks (at least for me), you will also find many of them in the Islay Walks booklet. 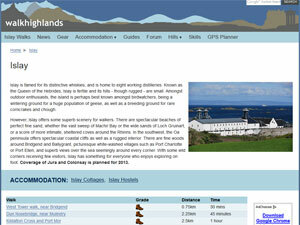 Nevertheless I think the site is a good source for walking ideas in particular for beginners and first time visitors. It will help you to get started and then move on to discover more of Islay, including the more remote parts only accessible on foot. The descriptions provide some background (like the bathing hut in Kildalton Bay mentioned in the Carraig Fhada and the Singing Sands walk), something I find makes walks much more enjoyable, learning about the things encountered on the way.